Incapacity due to illness or injury is a great fear for most people. No one wants to be left unable to make their own decisions or unable to express their preferences for the kind of medical care they will receive. Unfortunately, a sudden tragedy or the illnesses that so often accompany old age can often leave a person incapacitated. Why do I want to avoid conservatorship? How can I avoid conservatorship with an incapacity plan? How can a California incapacity planning lawyer help me? Conservatorship occurs when a person who is incapacitated has made no plans for who will manage his affairs or for what kinds of medical care he will receive. When conservatorship becomes necessary, your family members will have to go to court in the midst of a medical emergency, as they cope with your illness or injury. Your loved ones will have to prove you are actually incapacitated, which can be a painful process for them and a humiliating process for you as your physical and mental infirmities are presented to the court. Once the judge decides you can no longer be trusted to make your decisions, a conservator will be appointed. The conservator may not know your wishes, and may not be the person you would have preferred. This person can be forced to make difficult choices on your behalf, sometimes leaving him with lingering guilt. If he is not up to asset management, your wealth could decline. If he does not share your views on end-of-life care, you could end up receiving care you’d have preferred not to undergo or being deprived of care that could have extended your life. You and your family are far better off if you avoid conservatorship. You can do this with help from the Litherland, Kennedy & Associates, APC, Attorneys at Law. Our California incapacity planning lawyers can advise you on the tools you can use to express your preferences in advance on life-saving care and on who will be in charge of your affairs. A power of attorney: A power of attorney allows you to select the person who makes your choices on your behalf… instead of the court selecting. While this decision is out of your control in conservatorship, a power of attorney gives you the chance to choose a person to act for you who you can trust and who you have discussed your future with. Advanced directives for healthcare. There are tools including a living will and a Do Not Resuscitate Order that allow you to decline specific types of care if you have an end-stage or terminal illness or a permanent and severe injury. You can use these tools to make the choice about whether you want to live once you no longer have quality of life. You can also provide details on what kinds of care you do want, and can name a healthcare proxy to make decisions you have not addressed in advance. Every person’s incapacity plan is customized to meet their needs and to be appropriate for their assets, their life stage, and their family situation. Your plan will be comprehensive enough that if incapacity happens, you can still maintain as much autonomy as possible because it will be your decisions that control what happens to you. 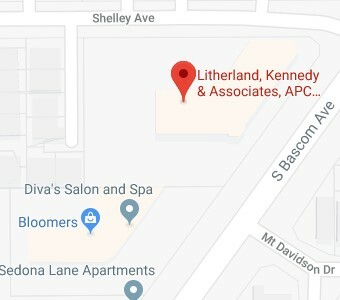 The Litherland, Kennedy & Associates, APC, Attorneys at Law will help you to make a plan that lets you keep some control over your life, even when incapacity robs you of your ability to speak for yourself. Your plan can address medical decisions, asset management, and more so you can protect yourself and your loved ones. Give us a call today at (408) 356-9200 or contact us online to find out more about how our California incapacity planning lawyers can help you.